Can I add the default animated auto-tiles for water to my parallax map somehow? Discussion in 'RPG Maker MV' started by ddblue, Oct 15, 2018. Hello all, I was wondering if there was a way to use the standard animated water tiles in conjunction with my parallax map. Currently I can put those tiles on top of my parallax map, but not under it. Ultimately, I'd love to cut out all the "still" water in my parallax map and instead just have the autotiles in those areas, then just lay the whole parallax map on top of that, but currently they only go on top (as shown in this picture). If I could somehow make the coast (parallax) part go above the tile part, that would solve my issues, but is this even possible? I'm sorry if I didn't explain myself well, but please feel free to ask me for whatever information you could use to provide advice on this topic and I will be happy to answer! I currently use the Orange Overlay plugin and Yanfly's Core plugin to change my base resolution to 1280 x 720. I watched a few tutorials online, but they didn't really answer my question. Edit: I did watch Fallen Lorelai's YouTube tutorial on this topic, but as you can see in my screen shot, my map does not match quite as nicely with the autotiles as hers did, so her solution would not work for me. Hmm if autotiles can't work for you. Maybe you could try turning the sides into events. It would be a character sheet that consist of animated water shore line sprites. 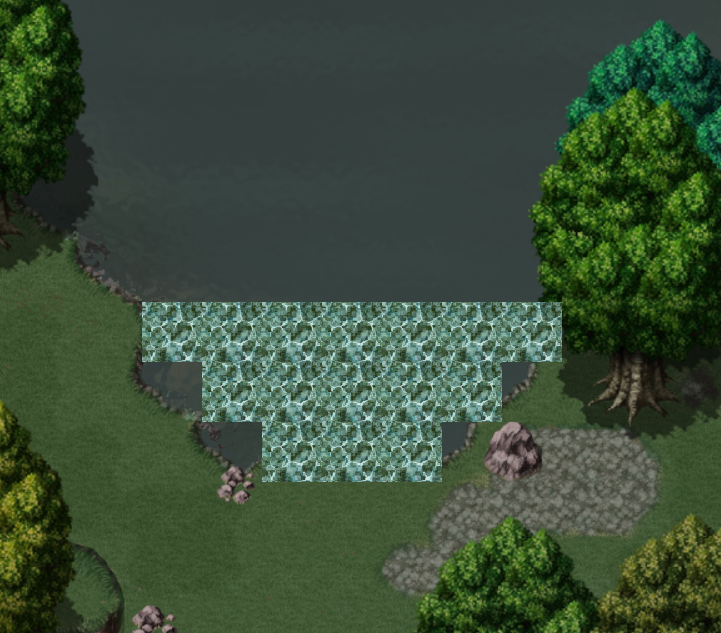 Then you just layer them over the tiles, and you can use the normal water tiles for the rest of the lake. You would essentially cut a hole in your parallax picture (leave an area empty), and put the autotiles in there. There's a YouTube tutorial by TheUnproPro that shows how to do it. Thank you for the suggestion. That would wind up being quite a few events, as this lake spreads out pretty far! But it’s better than the nothing I was coming up with. And dragonwys, thanks for the reply. That’s exactly what I’d like to do, but I’d still need the parallax on top of the autotiles, wouldn’t I? Thanks Xenphir, but I already have those. I’m just trying to get the animated tiles to work with the ground layer. Or did I misunderstand your reply (sorry if I did)? Ah you have to put them in the editor as normal, and your ground layer has to be put as a normal parallax background with a ! Before the filename. You can find this on the map options where you set the map size. I personally do not use orange overlays <ground> tag and make the ground a parallax instead. Then you erase every tile on the map except water and waterfalls. I also do not use the <ground> tag - I've always just done the same as you and simply add an exclamation mark to the front of the filename and enable it under map options. So your explanation intrigued me and I decided to remove the ! and actually use the ground tag for my parallax map. This worked! I can no longer see my map in the editor this way, but it places the parallax ground on top of the tiles, so I can lay the tiles out as I like, and they animate under the <ground> layer - achieving the effect I was looking for. And I didn't even have to change plugins!